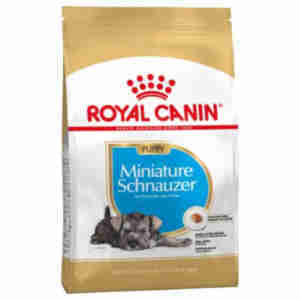 Royal Canin Miniature Schnauzer Puppy is a complete dog feed specially formulated for Miniature Schnauzer puppies up to 10 months old. This formula helps support harmonious growth while maintaining ideal weight thanks to a reduced level of fat. Enriched with L-carnitine. NATURAL DEFENSES - This formula helps support the Miniature Schnauzer puppy’s natural defences. dehydrated poultry protein, vegetable protein isolate*, rice, maize, wheat flour, animal fats, wheat, maize flour, maize gluten, hydrolysed animal proteins, chicory pulp, minerals, fish oil, soya oil, psyllium husks and seeds, fructo-oligo-saccharides, hydrolysed yeast (source of manno-oligo-saccharides), borage oil, marigold extract (source of lutein). Nutritional additives: Vitamin A: 30500 IU, Vitamin D3: 800 IU, E1 (Iron): 47 mg, E2 (Iodine): 4.7 mg, E4 (Copper): 9 mg, E5 (Manganese): 61 mg, E6 (Zinc): 183 mg, E8 (Selenium): 0.08 mg, L-carnitine: 50 mg - Technological additives: Pentasodium triphosphate: 3.5 g - Preservatives - Antioxidants. Protein: 30% - Fat content: 14% - Crude ash: 7.5% - Crude fibres: 1.8%. *L.I.P. : protein selected for its very high assimilation. Our mini schnauzer loves it! Our adult mini schnauzer has been on Royal Canin from being a puppy so when we got our new puppy we didn’t look further and she loves it and is thriving so what more could you ask for. Bought this on the recommendation of our vet, for our schnoodle puppy schnauzer cross poodle. Our puppy loves it and is thriving on it. Great price and fast delivery. Definitely a great product for a growing pup and he loves it plus great service from the site too.